The 2-way feedback from your equipment is displayed in real-time on the LCD. Check for the latest news, sports, weather and stocks on an MX-5000 connected to the Wi-Fi network. With the MX-850’s ability to replace up to 20 remotes, the days of fumbling through multiple dissimilar controls are a distant memory. A favorite for custom installers because of its eight control buttons, you’ll enjoy the sensible labels that your installer customizes just for you. The MX-980 is much more than a replacement remote. Advanced control tools provided by Universal Remote Control give your MX-980 the ability to orchestrate even the most complex system operation. Control your lighting and other devices you never dreamed possible, and do it all with one button press. The MX-3000 is a customizable color graphics tablet with a virtually unlimited memory capacity for your control needs. 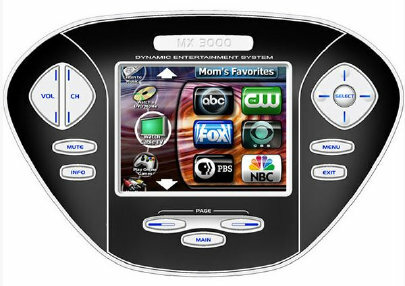 It offers buttons and a touch-screen interface, and can be customized with unique graphics and commands for each member of your family—as a well as for the babysitter or neighbors!